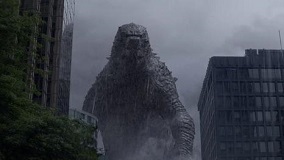 One of the greatest success stories of the 2014 summer movie season has been the resurrection of iconic movie monster Godzilla by British director Gareth Edwards. Long thought to have been killed off by Roland Emmerich's 1998 debacle, Edwards has largely succeeded in taking the giant lizard back to his atomic roots, channelling the spirit of the classic 1954 Japanese film that of course started the long-running franchise off. 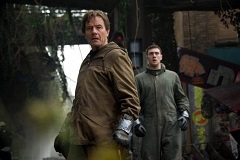 Aaron Taylor-Johnson, Bryan Cranston and Elizabeth Olsen are among the eclectic cast, playing characters fighting for survival as the eponymous Godzilla goes to war with two other monsters who've fed off nuclear radiation. Although the storyline is undeniably choppy and increasingly incoherent, Godzilla is nevertheless an impressively serious-minded blockbuster, effectively conveying the sense of what it would be like to see mankind displaced on the evolutionary food chain. The effects are spectacular and Edwards sensibly doles them out piecemeal style, ensuring that the jaw-dropping finale has all the more impact. And then of course there's the score from Alexandre Desplat, which is as important as anything in boosting the film's sense of drama. 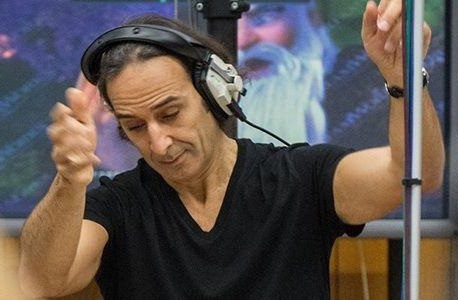 When it was announced that Desplat - the Frenchman behind innumerable classy scores like Girl with a Pearl Earring, The Painted Veil and the recent Philomena - was to be scoring the film, messageboards around the world lit up with excitement. Desplat, one of the most sophisticated film composers, scoring one of Hollywood's hoariest genres, the monster movie? How would he manage? The answer is magnificently. For although Desplat has indeed carved out a voice scoring acclaimed dramas like The King's Speech, he's also proven his versatility in the big-budget arena with the last two Harry Potter scores and The Golden Compass. Yet even by the standards of those works, Godzilla is very impressive indeed – in fact, it's probably the most impressively dark blockbuster score since John Williams' excellent War of the Worlds back in 2005. There's a great deal of Williams in the soundtrack – particularly Jaws and Jurassic Park – combined with the textural and percussive devices of Jerry Goldsmith and the uncompromisingly aggressive brass work of Elliot Goldenthal. And of course Desplat is respectful of Japanese composer Akira Ifukube, whose work on the original 1954 Godzilla was a ground-breaking mixture of atonal sound effects and militaristic marches. Yet pleasingly, Desplat's own voice is never in doubt – he's one of the few modern film composers who can absorb the styles of others whilst ensuring his own stamp remains. This becomes immediately apparent in the opening track "Godzilla!" – as denoted by the enjoyably OTT exclamation mark in the track title, the piece is a gargantuan, romping theme of the kind that's become increasingly rare. Beginning with groaning, synthetic noises (hearkening back to Ifukube), the theme then builds into a gargantuan march with powerful strings and brass underpinned by Desplat's familiar fluttering woodwind arrangements. It's essentially a statement of intent: this score begins as it means to go on – mean, loud and aggressive. Utilising an 102-piece orchestra (plus 80-strong choir), Desplat's intention is to knock the socks off the listener from start to finish, musically replicating the sheer, overwhelming size of Godzilla and his foes, the MUTO monsters. Yet Desplat's familiar characteristic touches are never in doubt, particularly the enjoyably understated injection of the Japanese shakuhachi wood flute that reminds us of the origins of the Godzilla series. Tracks such as "Into the Mines", "Return to Janjira" and "Las Vegas Aftermath" demonstrate this perfectly – Desplat has never been one to labour obvious musical clichés, instead deploying such devices in the most tasteful manner possible. "To Q Zone" introduces one of the score's key elements – a host of Japanese Taiko drums that resound with the primal power of the monsters at the centre of the story. 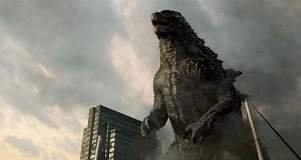 An early track like "The Power Plant" is a perfect example of the score's intelligent construction – ominously building tension, it eventually erupts into frantic strings and racing brass effects, all the while subtly underpinned by the Godzilla theme (this early in the drama, Godzilla is an unseen presence and therefore his theme isn't immediately apparent). Midway through the track, the music suddenly develops into a heart-rending, string-led elegy to accompany the tragic series of events involving Bryan Cranston's and Juliette Binoche's characters in the film. Later on in the score, such emotional material serves as a humane juxtaposition to the mammoth musical forces representing the monsters. Even so, it's the action material that's most memorable here, from the slashing/stabbing strings of "MUTO Hatch" and "The Wave" (which reaches Marco Beltrami levels of thrillingly frenzied chaos); to the massive crescendos of "Airport Attack". Later on, bubbling brass tension in the terrific "Golden Gate Chaos" (recalling classic John Williams scores) builds into monumental brass chords, against which Desplat pits the spine-tingling choir to capture both the terror and majesty of Godzilla in all his glory. In between there's even time for a few bars of Goldsmithian rumbling piano. "In the Jungle", "Missing Spore" and "Ford Rescued" meanwhile each build into colossal pieces filled with the thunderous Taiko drums (there's also a reprise of the electronic groaning signifying the presence of the monsters). These moments are leavened by quieter sections of downtime, including the beautifully noble trumpet in the first half of "Missing Spore". Although these little snippets may pale next to the volume of the rest of the score, they're vital for ensuring a dynamic listening experience. The trumpet again rears its head in the second half of "Vegas Aftermath", acting as a lament for the humans caught up in the destructive battle between Godzilla and the MUTOs. 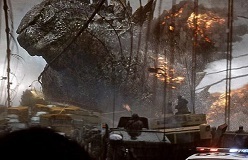 As the score begins to approach its dramatic endgame, the trumpet becomes decidedly more defiant ("Following Godzilla") as the military battle against the monsters gets underway. The climax is where Desplat pulls out all the stops, teasing the listener with the increasingly cacophonous "Let Them Fight", which is over almost as soon as it begins. The influence of John Williams' classic Jaws is again apparent at the start of "Entering the Nest" before the overwhelming force of the brass section thunders through the speakers – the deafening phrases in the track's second half are quite stunningly ferocious. At this point, Desplat re-introduces the main theme, emphasising the urgency of Godzilla's battle against his foes. "Two Against One" and "Last Shot" build to heart-pounding proportions, whether it's the thundering Taiko drums in the former; or the brassy octave leaps of the latter that catapult the main theme to even greater heights. In moments such as these, Desplat wonderfully resurrects the spirit of Elliot Goldenthal's classic 1990s scores Alien3 and Interview with the Vampire – the brass work in particular is fiendishly complicated and utterly brilliant. There's time for one more action blowout in "Godzilla's Victory", the Goldenthal-esque brass trills building into a triumphant statement for full orchestra and choir. Desplat then sensibly allows the listener to catch their breath, the second half of this track and the first half of the next, "Back to the Ocean" restoring a sense of human compassion. Then at the very tail end of the score, Desplat allows the main Godzilla theme to build into heroic proportions, ironically celebrating the giant lizard as mankind's saviour – which of course makes us anticipate his next big-screen appearance. It's a rip-roaringly old-fashioned climax. Then again, Godzilla as a whole is a rip-roaringly old-fashioned score, the kind thought to have become a rare species in this era of focus-grouped, synthetic blockbuster music. That Desplat has been able to come up with a score so powerful and overwhelming yet intelligently written bodes well for the future of scores in this area – after all, if director Gareth Edwards is capable of allowing his composer this much creative freedom, then frankly all movie directors are capable of it. 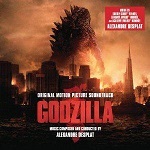 Desplat has absorbed both the sound of the original 1954 Godzilla and also that of classic disaster movies to conjure up a thrilling throwback that is positively gargantuan in nature. Yet at the same time, Desplat never compromises his own musical voice – the score is rife with his own unique touches, from the incredibly intricate orchestration to the clever development of the various themes and motifs. It's Desplat's first monster movie score and it's a resounding, hugely exciting triumph, proof positive that this adaptable composer can indeed turn his hand to practically every genre. A firm candidate for best film score of 2014. The score album is available on CD and as an MP3 download at these links: Amazon.co.uk or Amazon.com.